TaylorMade's recently released M5 and M6 drivers. Like the previous M3 and M4, the new TaylorMade M5 ($549.99) and M6 ($499.99) drivers are built with Twist Face technology designed to help correct shots struck in the high toe area of the face as well as those hit in the low heel. And while Twist Face does help produce more distance due to straighter shots, that’s just the tip of the iceberg in regards to yardage gains from the new models. According to the folks at TaylorMade, unlike past models that were designed to provide max COR and ball speed but couldn’t always deliver due to challenges involved in manufacturing tolerances, every single M5 and M6 driver are made to provide maximum speed for all players including both Tour pros and weekend warriors. The secret is called Speed Injected Twist Face, which incorporates not only the aforementioned Twist Face design but also a thinner clubface with redesigned Inverted Cone Technology, a larger Hammerhead sole slot, and internal support foam with varying amounts of resin that’s “injected” via face ports. Here's a detailed look at both models in the lineup. The M5 family consists of the M5 driver, M5 Tour driver and M5 fairway wood. The M5 driver is loaded with the previously mentioned technologies, arguably the most impressive of which is the resin injection design. Simply put, the folks at TaylorMade have figured out a way to tighten the tolerances of their drivers by building them with ball speeds that actually exceed USGA rules — and then inject resin into the face via ports in the heel and toe areas of the face to actually reduce speed and bring it right to the legal limit. Through this technique, every driver produced is more or less guaranteed to provide maximum speed at impact. Along with the “speed injection” technology, a face that’s approximately 20 percent thinner than that of the M3 provides a 66 percent larger sweet spot, allowing for significantly improved results on off-center hits. A larger Hammerhead 2.0 slot in the sole provides more ball speed on strikes low on the face while a carbon composite crown and sole panels allow for a more optimized CG location, resulting in increased forgiveness and improved trajectory. Another significant improvement in the M5 design is a new Inverted T-Track sliding sole weight design, which replaces the previous Y-Track and provides 1,770 CG configurations for customized performance. The key is two 10-gram weights that can be easily adjusted along the improved T-Track to intuitively tune launch angle and spin rate to fit personal preference. In total, the Inverted T-Track allows for one degree of launch angle change, 600 RPM's of spin, and approximately 25 yards of left-to-right adjustment. In addition to the new T-Track, an adjustable loft sleeve provides another two degrees of movement in loft, lie angle, and face angle, making it outrageously customizable. The M5 Tour driver ($549.99) provides all the same technologies as the standard M5 but in a more compact, 435cc size that provides lower spin rates and increased shot-shaping control. The M5 fairway wood ($399.99) is a whole new ballgame. Featuring a multi-material design with a titanium body, carbon composite crown, and 65-gram movable steel sole weight, the fairway is the first of its kind to incorporate Twist Face technology for increased forgiveness on high-toe and low-heel hits. The combination of lightweight titanium and carbon composite allows for the extra large sole weight that accounts for more than 30 percent of the total weight of the clubhead, creating the desired low CG location for easy launch and forgiveness. The M5 fairway can be customized for desired shot shape by simply sliding it toward the heel or toe or by adjusting the 12-position loft sleeve in the hosel by two-degrees in either direction. The M5 driver will be available in 9-, 10.5- , and 12-degree lofts while the M5 Tour driver will come in 9- and 10.5 -degree lofts only. The M5 fairway wood will be available in Rocket 14-, 15-, and 18-degree lofts. Available in a standard and draw-biased D-Type model (both $499.99), M6 is built with most of the same technologies as M5 except the Inverted T-Track in the sole. In comparison to the previous M4, the M6 has a slightly taller face and approximately 54 percent more discretionary weight due to a carbon fiber crown and complete carbon fiber sole. The weight savings not only allow for a more aerodynamic shape but an “inertia generator” that locates more weight low and deep in the clubhead for a lower CG and increased forgiveness in comparison to the M4. The anti-slice D-Type model is built with the same technologies but features a draw bias and new topline that creates a more square appearance than typical draw models. The M6 and M6 D-Type drivers will be available in 9-, 10.5-, and 12-degree lofts. The accompanying M6 fairway wood ($299.99) represents a significant improvement over the previous M4, featuring not only Twist Face technology but also a new Speed Pocket in the sole that improves both ball speed and turf interaction at impact. Like the driver, the M6 fairway wood is also built with a larger carbon composite crown, allowing for a lower CG location and more stability on off-center hits. An M6 D-Type model that provides up to 15 yards of slice correction is also available. TaylorMade's M6 fairway woods (L) and Rescue (R). The M6 fairways will be available in Rocket 14-, 15-, 18-, 21- and 24-degree lofts. M6 D-Type fairways will come in 16-, 19- and 22-degree lofts. For those looking to round out their woods, a new M6 Rescue ($249 each) should fit the bill nicely as it also features TaylorMade’s innovative Twist Face technology as well as a low CG for improved launch from a variety of lies. For added ball speed and distance, even on mis-hits, TaylorMade engineers designed a more flexible Speed Pocket in the sole that provides a bigger COR area. The M6 Rescue will be available in 19-, 22-, 25-, 28- and 31-degree lofts. 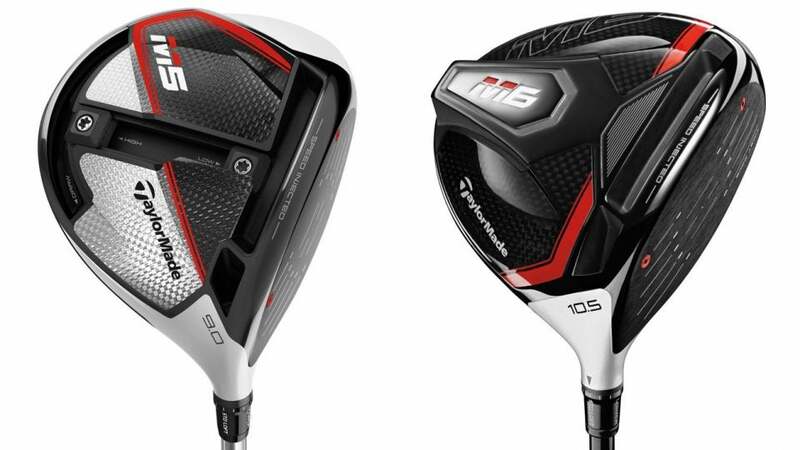 TaylorMade's M5 and M6 metalwoods will be available for pre-order on Jan. 18 and at retail on Feb. 1.